Before we start talking about her writing, I want to thank Charlene for joining us this week and telling us a little about herself and her western historical romance release, SCENT OF ROSES! Welcome, Charlene! It was a strange fluke really. I was an avid reader of romance novels. Then one morning I woke up from a very real and compelling dream and knew it had to be in a book, so I dragged out an old portable typewriter (1980 – pre-computer days) and began. I’ve been writing ever since. I write historical romance set in the American West. I love books that take me to a different world and show me what it was like to live then and there. My fascination with the Old West goes back to my early childhood when I shocked my mother by telling her I was born in the wrong time, that I should have been a pioneer. She was not happy. Two things: the research which is so engrossing, and typing “The End” when the book is done. Actually I love the entire process of writing, the brainstorming with friends to create a new story, finding just the right details to bring a scene to life, just the right words to express what I mean. Of course, I also love hearing from people who like my work. I get my ideas from many places. My early stories often came from dreams, as mentioned before. One of my books came from a friend I had asked to give me an idea for a new story. She said write about a woman who has to find a man she can only identify by a scar on his bottom. Taming Jenna was the result. That one is only available in paperback from used book stores, but will probably be released as an e-book next year. Oh, heavens, what a question. I don’t compare myself to others so this is hard to answer. Probably, if anything, my vivid descriptions and scrumptious heroes. Yes, I’m an avid reader, although lately it’s been harder to find time to sit with a book. My favorite genre to read is still historical, but I read all the subgenres as well as western. I also read contemporaries, but always romances. My next book to be released is titled Divine Gamble and tells the story of Maisy who deals faro in saloons and whose goal in life is to avoid being caught by the man who is after her, and to keep her teenage son a secret from the world. The hero is a gunslinger accused of killing a woman. To avoid capture and to find Maisy who he has learned is in danger, he poses as a circuit preacher. It’s a fun story with great characters. BE SURE TO COME BACK to read more about Charlene and her novel, SCENT OF ROSES, on Wednesday’s Karen’s Killer Book Bench!! Charlene’s also sharing a fascinating blog about polygamists in history! Happy Reading! 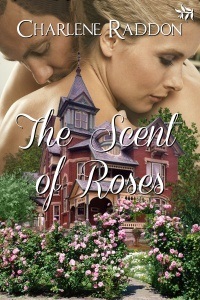 **SPECIAL ANNOUNCEMENT: Charlene will give away a copy of her release, SCENT OF ROSES, to one of her lucky readers who comments on either her Monday Interview or Wednesday Book Bench blogs!! Winner will be randomly selected and announced Monday, August 12, 2013. Thanks, Charlene, for sharing your stories with us! Thanks for having me, Karen. Long as we’ve known each other, I can’t believe we haven’t hosted each other before this. Hey Char! I too, love writing “The End” as one of my favorite things about writing! Hi Charlene – This is a great interview. How hard is it to keep your interviews interesting? They always read so fresh. Divine Gamble sounds like a lot of fun! I enjoyed reading your interview. Hi Charlene, I just want to say I really enjoyed your interview and tell you I love your books. Hey Janice, good to see you again. I agree about reading before bed, very relaxing. I could recommend some really great western contemporary authors. Let me know. HI, Peggy, Liz and Cathy. Thanks for stopping by. Means a lot to me.